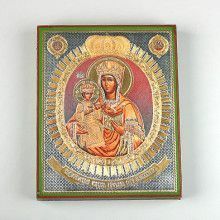 Actual Russian monks living and working in Sofrino monasteries crafted this Icon which features the Holy Mother Mary Vladimirskaya and Baby Jesus wearing robe. 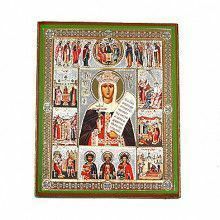 Also has incredible detail of various images surrounding the center image. 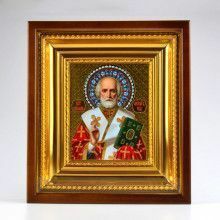 The entire Icon is accented with a gold leaf background and framed on a traditional slab of wood.